Gap-filling epoxies for permanent bonds. Our high-strength 2-part adhesives are activated when their resin and hardener components are mixed in equal parts. Each 4-ounce set has two 2-ounce bottles, ready for mixing. Fast-setting mixture has 5-minute working time. Full bond strength in one hour. Slow-setting mixture allows 20 minute working time. Full bond strength in 8 hours, for a rigid waterproof joint. Slow-setting black mixture is great for inlaying ebony fingerboards. 20 minute working time. Wait 3 days before sanding. Note: With all epoxies, the slower the setting time, the stronger the bond. Use adequate ventilation and avoid skin and eye contact. A little bit of glue hides imperfections... Dan Erlewine personalizes a fretboard with the customer's name in pearl: "Hoss." 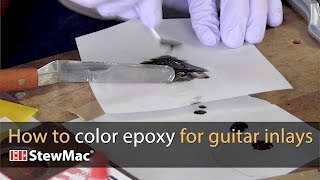 There are small gaps around the inlays, and dan shows how to make those gaps disappear. Dan also shows a neat magnet trick for cutting thin slices off the end of a fretboard. Used the black epoxy to fill voids in claro walnut and it worked great. Let it harden and then scraped and sanded the surface flat. defects were virtually undetectable when done. The epoxy works fine, it was just that both bottles were labeled 'part 1'. I guess it was just one of those little quality control things where two of the same labels got put on both part 1 and part 2 of the epoxy. I used it to glue in some abalone inlay-works just fine. We're sorry that both of the bottles of epoxy you received were labeled "Part 1 Resin", and apologize for any confusion this may have caused. Thanks to your comment, we have triple checked the epoxy in our inventory for this issue, and are happy to report all are labeled correctly now. If you ever need to contact us with an issue, our friendly Customer Support Team is available and always happy to help. Please feel free to give us a call at 1-800-848-2273. I bought this for nonadjustable truss rods, excellent. Recently purchased the slow set epoxy. Have been using it for years with excellent results. This particular purchase, I had trouble with the resin being bad. I contacted stewmac customer service and it was quickly resolved. Replacement was immediately shipped and arrived in short order. You can rest assured stewmac is looking out for you above all - thanks stewmac staff! - Ron C. - Ga. Although my purpose for the item purchased was totally unrelated to the purpose(s) for which the product is designed, it nonetheless did the job as perfectly as I could have wanted.